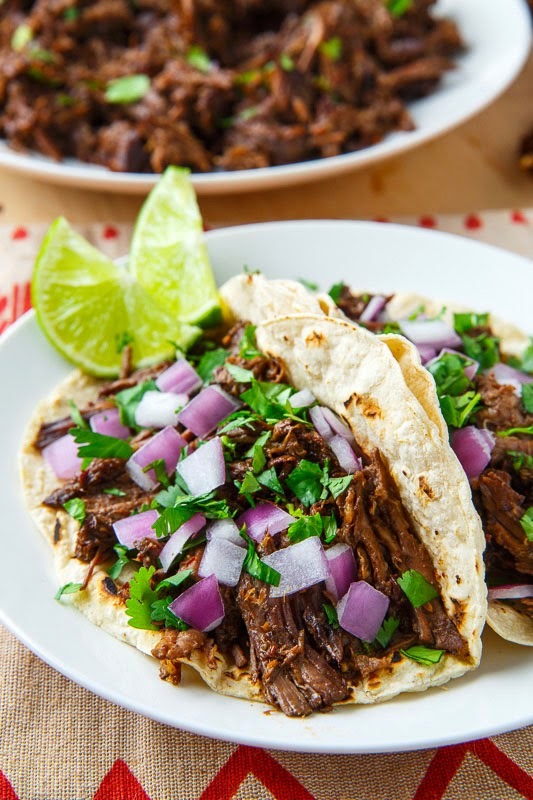 Slow braised, melt in your mouth tender beef barbacoa in a tasty sauce with spicy chipotle chilies that is perfect in tacos with diced onions and cilantro! 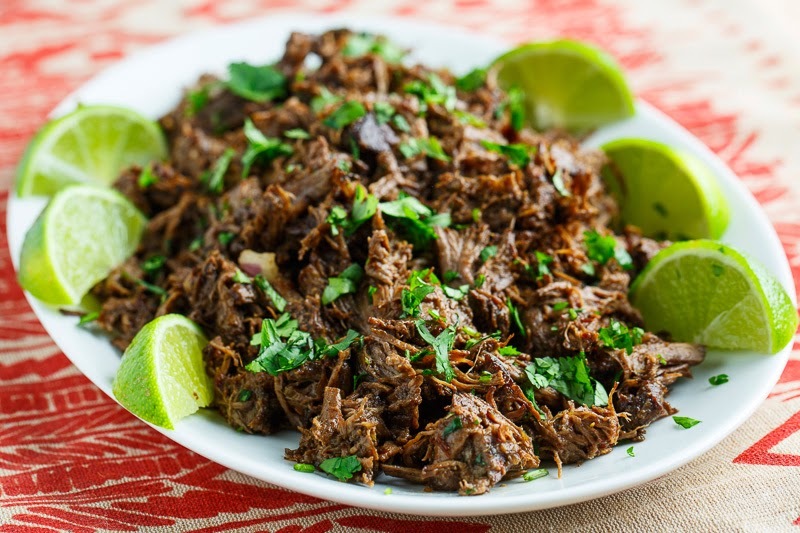 I really enjoy a nice slow braised meat dish since the long braising time makes the meat melt in your mouth tender and really brings out it’s flavour so when I was thinking about recipes for Cinco de Mayo beef barbacoa immediately came to mind! Although the cooking style has changed from the traditional fires and pits to modern stoves, ovens and even slow cookers this dish is tasty no matter which way you make it! 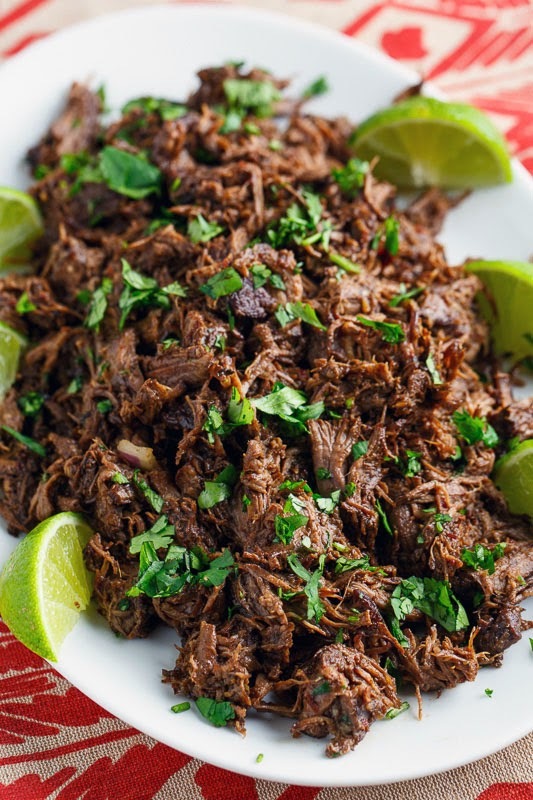 This dish is super easy to make, you pretty much just brown the meat add some liquid along with the seasonings and simmer, bake or slow cook until the meat is falling apart tender before shredding and enjoying in tacos, burritos, quesadillas, etc. The primary seasonings are chipotle chilies, cumin, oregano, garlic, lime juice and a touch of cloves that adds an amazing aroma and that hint of something exotic. Despite being so simple the long slow braise makes this dish truly amazing! It’s so good that I often find it difficult to not gobble it all up by the fingersful before it even makes it into the tacos! 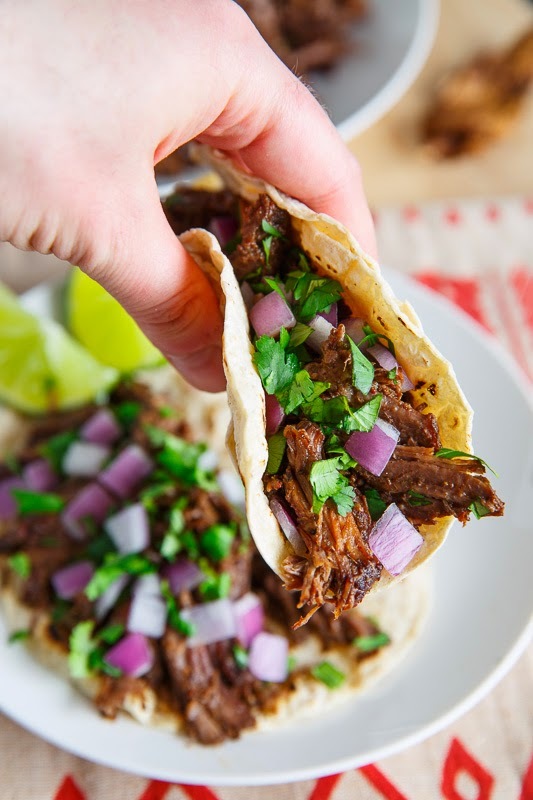 Speaking of tacos, I always like to enjoy a fresh batch of beef barbacoa in tacos simply dressed with tangy onions and cilantro to let the barbacoa flavour shine! Note: This recipe is perfect for the slow cooker especially in the summer when you may not want to have the oven on making your place even hotter than it already is! I’ll take three to go! Heat the oil in a pan over medium-high heat in a large heavy bottomed oven safe pot, add the beef and brown on all sides, about 10-15 minutes, before setting aside. Add the onion and cook until tender, about 3-5 minutes, before adding the garlic, cumin and oregano and cooking for a further minute. Add the broth, chipotle chilies, lime juice, vinegar, salt, pepper, cloves and bay leaves, bring to a boil, reduce the heat and simmer, covered until the meat is pull apart tender, about 3-4 hours. OR Transfer the pot to a preheated 275F/140C oven and braise until the meat is pull apart tender, about 3-4 hours. OR Transfer to a slow cooker and cook on low for 8-10 hours or on high for 4-6 hours. Remove the beef, shred and place back in the pot. 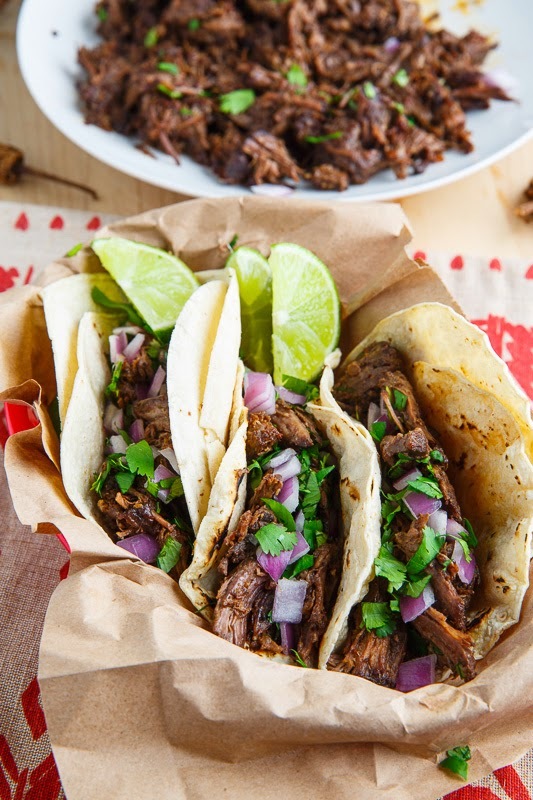 Assemble the tacos in the tortillas with beef barbacoa, diced onions and cilantro or your favourite taco ingredients. 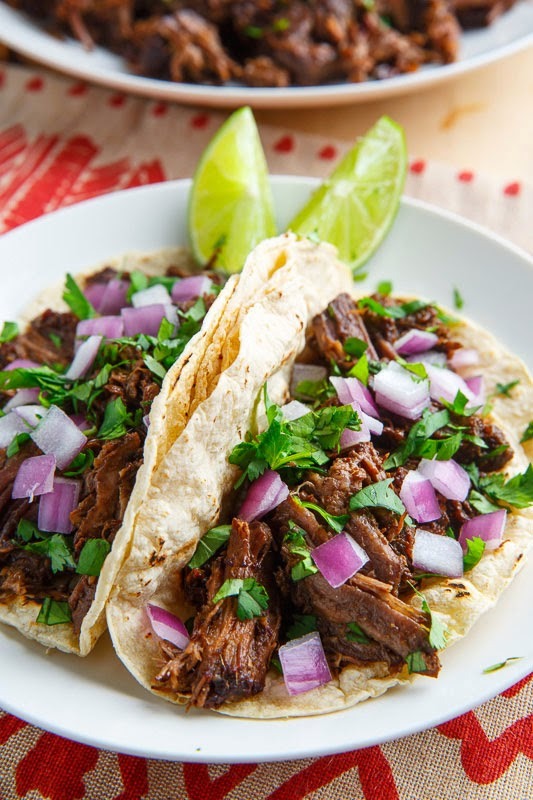 Option: If you are making this in the slow cooker you can optionally skip steps 1-2. Option: Add a few splashes of fish sauce! Perfect tacos for taco night! What a great dinner! My kids will love these!! Mmm I love me some tacos!! What brand are you using .. for Tacos ? Those in the photo look like flour, they are much "finer" than the corn tortillas that I am used to seeing. They look like I would like them better if they still have that corn taste . NotesFromAbroad: The tortillas are corn tortillas that a local Latin American shop makes from scratch. A fantastic recipe for Cinco de Mayo! Mmm these look delicious. Going to try them. A good braised meat is such a comfort food, I think you've nailed it Kevin! Looks delicious! I could spend my entire life in these tacos. Not only does this sound authentic ( I live in Arizona), but it is economical. You have an amazing attention to details! I was wondering if you've used fresh or dried oregano? Thanks! Anonymous: I used dried oregano. Enjoyed these tonight. I cut back on the chipotles to one as I have problems with too spicy but now I think I could have gone with two. Leftovers destined for your burrito bowls! LuisaCA: I'm glad you like it and enjoy the burrito bowls! I just made these tacos and they were incredible! The seasonings are in perfect proportion and make the meat absolutely delicious. Thanks! I made this yesterday in my pressure cooker, it took 1-1/2 hours to cook plus 25 min prep. Turned out fantastic. This is a recipe I will be making on a regular basis. Now I just need to make more of the yummy looking recipe's I have pinned from you! Thanks! Rene S: I'm glad you enjoyed them! I made this in my slow cooker yesterday and it was delicious! I had to add more beer to keep the meat moist. Also, I only used three chipotle peppers and it still had a nice kick. Thanks for another great recipe! Stephanie: I'm glad you liked them! Looks amazingly tasty Kevin. I wanted to pick your brain about how you heat up your corn tortillas? Also, in your opinion, does it really make a difference if you sear/brown the meat chunks if using a crockpot. I've tried both methods and can't tell if one way is better than another. If no difference then it'll save time skipping that step. So, so good. I too used a bit less than 3 chipotle chiles, but I think I could have used all four. Thanks, Kevin, for yet another winner!! Cheesesteak: I think that browning the meat first adds flavour but you can skip it if you don't notice the difference. I usually heat up my corn tortillas in a cast iron pan over high heat but over the grill is also good. Just made these for supper. Used 3 chipotle peppers and was decently spicy. Store was out of chuck roast so used stewing beef. Cooked for 4 hours in oven. I added a slaw and some cilantro lime sauce. Will definitely be a regular recipe. This is currently in the slow cooker. The local target out here didn't have chipotle peppers, so I used a can of Rotel that had chipotle peppers in it… We'll see how it turns out. I also used beer for the liquid. It's my first time cooking with beer and I'm scared haha. Can't wait to taste it! My husband loved this recipe. I made it without the chipotle peppers in adobe since we didn't have any at home. Also my 14 yr old is a heat wimp. I did add some ground chipotle pepper and a smidge more water since we didn't have the adobe sauce. Amazing results. It is officially in our inner rotation. Thank you for sharing this recipe. I can not tell you how THANKFUL that we are. Really, thank you. This is like EATABLE GOLD; it is so good. We used it on many things this last week, and I say it's EASILY as good as Chipotle. Please, share more recipes like this. Maybe even create your "Favorite Recipes". I can't believe how easy this way and how good. Like above said, this will be a REGULAR RECIPE for our family for years to come. Here's an idea too. Do you know how to do Chipotle's chicken chunks like in their burrito bowls. We are almost stopping eating out, because it's got too expensive. So, we are COPY-CATTING stuff, so that is one thing still on our list. I hope you can help break the code. Here is a picture of it: I couldn't find one, but it's the charred chicken that is little spicy. Also, maybe one day post something about a Cobb Salad. Don't know if you like them, but I'm trying to get the Vignette down. Anyway, once again, thank you for the Barbacoa (hope spelled right). That is one of best BASE RECIPES that we have found in quite some time. When using beer, what type would you suggest? Not many people actually use a comal or griddle to heat up their tortillas, I like mine like you did it here, lightly toasted which adds another layer of flavor especially if they are fresh tortillas from a mexican market. Cooked these with venison because I had a ton in the freezer. They were delicious. Venison was so tender and the spices toned down the stronger taste of the venison. My kids are not huge fans of venison, but they had no idea. Great recipe! I like the sound of using venison! I am a spicy food freak, but deseeding the Chipotle peppers was left out of the directions, so I did not. 4 chipotles was WAY to overpowering with heat. The meat was AMAZING and I cannot wait to make this again, with less chipotles.